Check out this adorable pixel Honey Hart that my pal Sarah sent me! I made a page for fanart to collect a couple of things that people have drawn for me. Awesome. God, this makes me want to play a NES Band Vs. Band game…or maybe make one. You are disgustingly talented. And apparently magical at beating the Webcomic plugin into a pretty shape. Aw, thanks! I actually found this plugin pretty friendly to work with overall — I did have some really dumb frustrations while I was setting the whole thing up and styling it, but that was mostly due to me being out of practice with code. Turp looks like a kabuki mask in the last panel. And awww… I was hoping she’d have a “super electric dream” too. Yeah, I wanted this page to shift to the side and just kinda be CARTOON AMBITIONLUST without the mega focus on innuendo. I also wanted to start building more context for this World Of Bands. Turpentine seems kinda like an Olympic-level aficionado of said electric dreams, though. She’ll get her share of saucy moments. Is this comic set in the nineties? It’s got a lot of 80s & 90s influenced stuff going on, but it takes place in this setting that I’ve been calling “retro-contemporary”…like, it’s not quite the real world, and I don’t think of it as happening in the past. I imagine it like this alternate version of the present where technology didn’t move forward in the same way, and it’s all tapes and records and dialy phones with long cords. Hmm, very interesting!!! And very important to understanding the world of bands. Thanks, Kathleen! I feel like writing one more thing about the World Of Bands: it also has an alternate-universe music history. So, for instance, these guys didn’t have The Beatles, but there was probably some similarly influential group in their world. I broke this rule *once* before deciding it was a rule…there’s a really early one where Turpentine talks about pretending to be David Bowie and Black Sabbath as a kid. At the time, I was thinking that this was set more in an ambiguous timeline than an alternate universe, and I picked those two acts partly because their fandom spans anywhere from the late 60s to the present. I may go back and change that at some point, because it really stands out to me as breaking the world’s rules now. Oh yeah, this was outraging pretty much everybody in my life yesterday — turns out it was never really the new and immediate crisis that the initial reporting made it seem like, and now we have an update that the federal justice minister has made an official announcement that the marriages are considered valid in Canada. It’ll be interesting for anyone interested in LGBTQ issues and advocacy to follow how this progresses re: Canada’s laws. She’s doing a master’s degree in Women’s & Gender Studies — and the rest of the band, although generally down with this, is not nearly as keen on doing a bunch of high-concept songs inspired by academic feminist theory and historical characters. Conflict! Yeah! She’s been on my radar for a while. There’s another one where Turpentine is wearing a shirt based on the same design as the Mascara poster in her bedroom. Naw, but I think she might be friends with Arsenic’s mother. 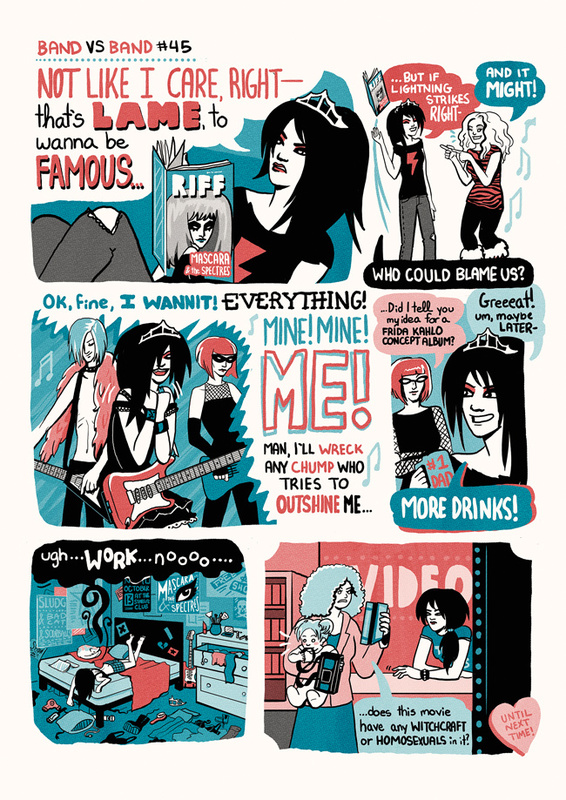 Turpentine is really channeling her inner Misfit in that third panel. Especially her usage of the word “chump”. In other news, I just read the entirety of the comic– love it! Can’t wait for more updates! Yeah, she’s basically going full Pizazz there! And thank you – glad you liked it, new updates soon!